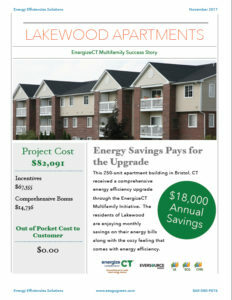 This 250-unit apartment building in Bristol, CT received a comprehensive energy efficiency upgrade through the EnergizeCT Multifamily Initiative. 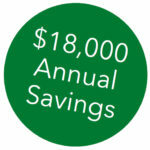 The residents of Lakewood are enjoying monthly savings on their energy bills along with the cozy feeling that comes with energy efficiency. Apartment complex. 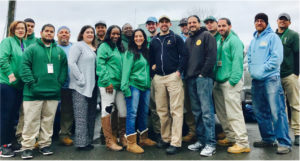 The project consisted of air sealing, domestic hot water measures, unit lighting upgrades, and common area and exterior lighting upgrades, totaled over $82,000 of work. 100% of this work was covered by incentives under the EnergizeCT Multifamily Initiative, resulting in zero cost to the owner of the building or to the tenants who call Lakewood home. 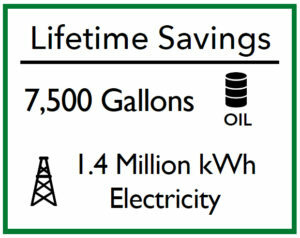 The property is expected to yield significant lifetime savings of oil and electricity due to these upgrades, and is projected to save over $18,000 per year in energy costs. All of our Leads and Techs are BPI Building Analyst and Envelope Professional Certified. 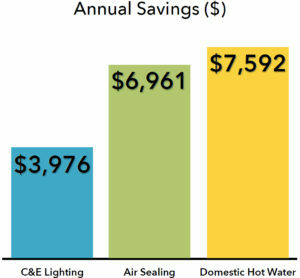 At EES we take pride in understanding the whole building as a system to ensure that the customer gets what they need; and understands the ROI to help them make smarter purchases. Our Multifamily project managers hold the property owners hand every step of the way, from initial walk through to project completion and inspection, ensuring the process goes as smoothly as possible.